Alan Hemming, MD, is one of the few surgeons in the country who has treated unresectable liver cancer by temporarily removing the patient’s entire liver for reconstruction. Distinguished transplant and cancer surgeon, Alan Hemming, MD, has been recruited to the University of California, School of Medicine to launch a multidisciplinary center for the treatment of advanced liver disease at the UC San Diego Medical Center and Moores UCSD Cancer Center. This innovative program is designed to offer adult and pediatric patients in the western United States a single destination for the treatment of complex liver disease, from advanced diagnostics to experimental medical therapies and novel approaches for liver resection and transplantation. Known for his lifesaving surgical skills, Hemming is one of the few surgeons in the country who has treated otherwise unresectable liver cancer by temporarily removing the patient’s entire liver for reconstruction. After removing and cooling the liver, Hemming performs the meticulous process of tumor removal and blood supply reconstruction. Upon completion, the tumor-free liver is “re-implanted” into the body. This novel form of resection provides the possibility of cure for patients with few other options. Hemming has performed more than 500 liver transplants such as split, living-related, and domino procedures, including a successful liver transplant for one of the smallest recipients in the world – an infant weighing just over four pounds. A gifted surgeon, Hemming has performed more than 900 liver resections. He specializes in all aspects of hepatobiliary surgery including both open and laparoscopic liver resection for tumors, resection of the pancreas and bile duct, and portal decompressive procedures. Among Hemming’s plans are to develop an adult living donor program for liver transplant, an expanded program for primary and metastatic liver cancer and a clinical research program to explore new technologies and their application to liver surgery. 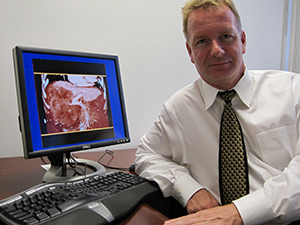 He was recently co-principle investigator in an assessment of image-guided liver surgery with Memorial Sloan Kettering Cancer Center and the University of Pittsburgh Medical Center. His plans include bringing the development of such new technologies to UCSD. 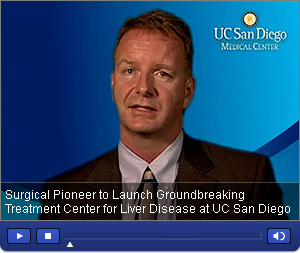 Prior to coming to UC San Diego, Hemming was the Chief of Transplantation and Hepatobiliary Surgery at the University of Florida where he developed one of the nation’s fastest growing treatment centers for hepatobiliary disease. Under his leadership, the program’s surgeons were able to aggressively resect and cure up to a third of patients who had been identified as unresectable by other institutions. Hemming earned his medical degree from and completed his general surgery residency at the University of British Columbia in Vancouver, British Columbia. He completed his internship at St. Michael’s Hospital in Toronto. He completed fellowship training in both hepatopancreaticobiliary surgery and liver transplantation from the University of Toronto, Toronto Hospital in Ontario. An NIH-funded researcher, Hemming is named to both America’s Top Doctors for Cancer as well as America’s Top Doctors. He has authored multiple book chapters and more than 100 peer-reviewed publications in the areas of advanced liver surgery techniques, liver transplantation and the care of patients with hepatobiliary disease. Hemming currently sits on the ethics committee of the American Society of Transplant Surgeons. He is also member of the American Surgical Association, the Southern Surgical Association, the Society of Surgical Oncology, and the American Hepatopancreaticobiliary Association.